350 Tacoma hasn't added a story. Courageous dock work Tracy Wiegman was willing to stand up and tell the truth about the Puget Sound Energy Liquefied Natural Gas project currently under construction in the Port of Tacoma. Working with 350 Tacoma, her message has been seen over 6,000 times through social media. But now we need to spread her important message further! Puget Sound Energy (PSE) spends tens of thousands of dollars each month spreading their propaganda about their Liquefied Natural Gas (LNG) project in the Port of Tacoma. Well, we have less money but we have the truth and people power on our side! With this fundraiser we want Tracy's video to play as Google and YouTube ads in the Tacoma area to help counter PSE's green washing. The cost of that depends on clicks and views, so we're not sure how long those funds will last to be precise, but the longer the better. We also want to fund a week of local advertising which would cost $250 (the location of which we will divulge at a later date). PSE LNG: Not Safe. Not Green. Not Local. Not Needed! Help us defeat this unnecessary project! 350 Tacoma hasn't posted any updates yet. 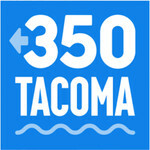 350 Tacoma is managing the funds for this campaign.